Last November, Joni Mitchell celebrated her 75th birthday with a concert and party, the guest list for which included such notable names as Tom Hanks, Cameron Crowe, Mandy Moore and Emmylou Harris. Those people boast plenty of merit, but they were all there for Joni, a legend herself. 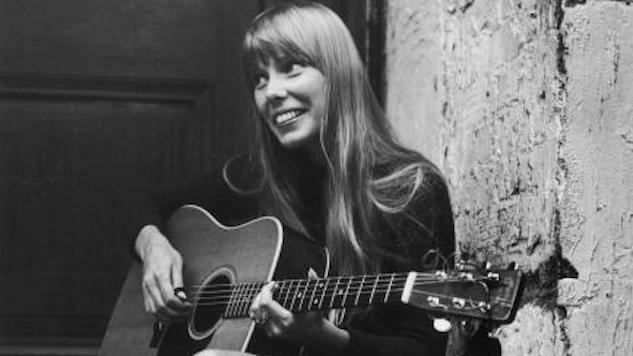 With a career lasting nearly four decades, a discography spanning more than 20 albums and voice that helped define the folk revival, Joni is an icon. As actress Rosanna Arquette wrote in a personal message for the singer which appeared in her birthday concert program and a Vanity Fair write-up, “Her music defined the feeling of being alive for me, for oh these many years.” The same is true for many of her fans. There’s hours of Joni Mitchell recordings in the Paste archives, but some of the most interesting aren’t from the Newport Folk Festival or her stadium shows, captivating as they may be. Sometimes her best performances reveal themselves in unexpected places. One such treasure is Mitchell’s performance at the Northrop Auditorium in Minneapolis, Minnesota, recorded on this day (Jan. 16) in 1976. She’s backed by a full band, and the crowd is lively and energetic. She plays tracks from her 1974 album Court And Spark, and her performance of “Help Me” even includes a brief saxophone solo. If there’s one thing these recordings prove, it’s that Joni Mitchell was an amorphous musician—she could capture an audience with just an acoustic guitar as easily as she could with a hyped-up jam band behind her. Listen to Joni Mitchell perform in Minnesota circa 1976 below. While you’re here, check out our list of her best songs.